No this isn’t another massive sarcophagus with unidentified bodies and weird ‘juice’ inside. This time, scientists have found something a bit more inexplicable. The Great Pyramid of Giza was built thousands of years ago, around 2500 BC, and is the oldest of the Seven Wonders of the Ancient World. Despite years and years of research, its properties and mysteries still fascinate scientists, who are discovering new things about it all the time. The Pyramid, which stands at 481 feet tall, was built for Pharaoh Khufu, and as a result was also believed to contain mythical qualities and ancient secrets. However, scientists are now also trying to ascertain its physical properties too. The latest discovery is no different, as researchers have found that the Egyptian Pyramid can concentrate electric and magnetic energy in its chambers and below its base, creating pockets of higher energy within its walls.Makes total sense, right? I know you all understand, but just for the sake of clarity, what that means is the researchers, from ITMO University, were checking out the electromagnetic energy in the Pyramid’s hidden chambers, including where the Pharaoh’s remains are. They found that, for some reason, the Pyramid seems to be able to concentrate electromagnetic energy inside its hidden chambers. The energy source required to transmit information (in the form of waves) from one place (material) to another. This information can be in the form of light, heat, or in any other form. The electromagnetic energy accumulates in the chambers […] It is shown that basically the Pyramid scatters the electromagnetic waves and focuses them in to the substrate [underground] region. The discovery, however, goes beyond understanding the secrets of the Pyramids. Researchers believe the way electromagnetic energy distributes in the structure could help create efficient nanoparticle designs, reports the Daily Mail. Choosing a material with suitable electromagnetic properties, we can obtain pyramidal nanoparticles with a promise for practical application in nanosensors and effective solar cells. 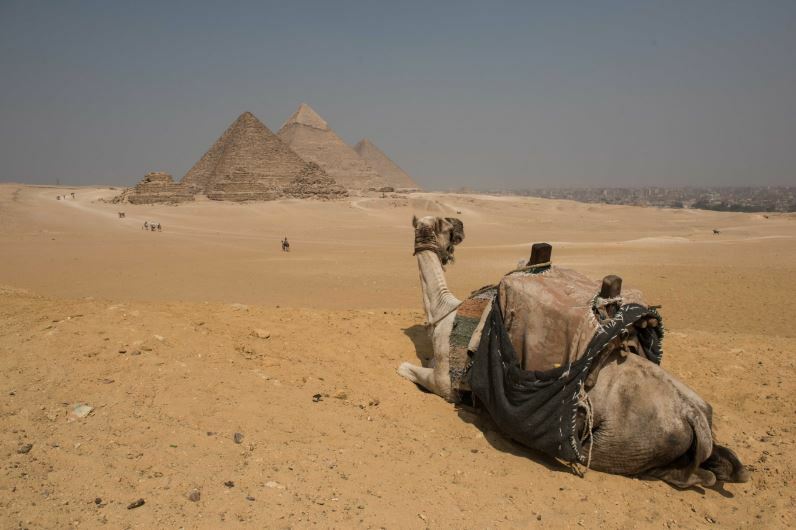 Last year, thermal scanning unearthed a major anomaly in the Great Pyramid. The scans revealed three huge adjacent stones at its base, which registered higher temperatures than those around them. This led to theories that they may be hiding another secret chamber that had not yet been discovered. Over 4,000 years since their creation, discoveries about the Pyramids are still being made. 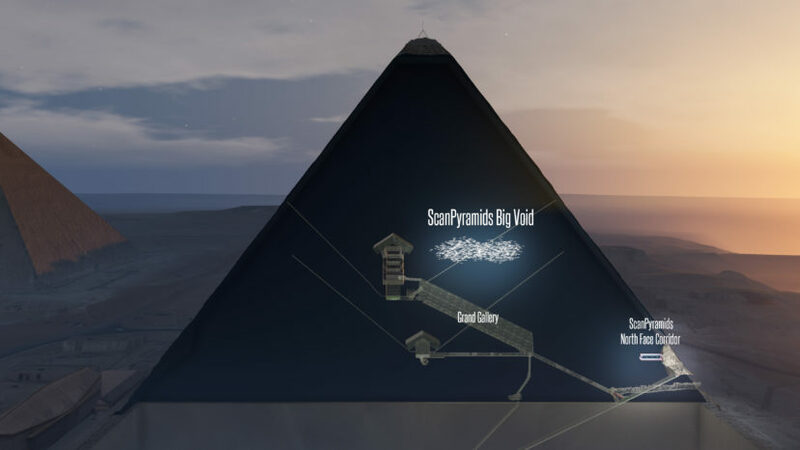 Just last year a huge void was found in the centre of the Great Pyramid above its internal Grand Gallery – a massive hall between two chambers. 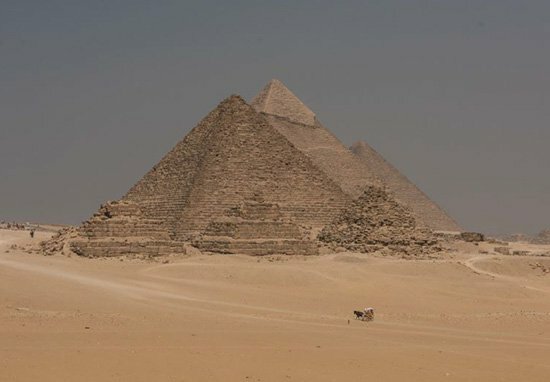 This discovery was made thanks to the use of cosmic-ray imaging, which allows the researchers to scan deep into the pyramid to get to the bottom of just what is inside.